The heavily revised rather than all-new Matiz now sports the Chevrolet badge and is the most important car in the company's line-up, accounting for a large chunk of its annual European sales. But the small city car market is now much more competitive than it was at the original Matiz's launch and it will be hard pressed to continue the same success. The essential Matiz formula remains the same – a cheap purchase price and minimal running costs for a basic but fun car. The latest model is also much more satisfying to drive than its predecessor, providing a timely reminder that it is possible to have fun driving a car with a tiny engine. Sadly, the first Matiz's cute, happy styling treatment (designed by Giorgio Guigiaro of VW Golf fame) has been erased and replaced with a more contemporary but more workaday in-house treatment. It's particularly disappointing as the Matiz concept car initially shown by Chevy's draughtsmen looked stunning. The rear is neater than the front, which has an unconvincing 'mean' face. The interior is much more like the original car, and is all the better for it. 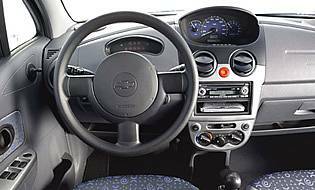 True, there is new instrumentation but the Matiz's real genius remains the way it crams an awful lot of space inside its tiny frame. Even rear seat passengers should have little to complain of on mid-length journeys and there's a decent boot as well. Like the Fiat 500 and Mini, it's a masterpiece of spatial management. That's not to say the Matiz is perfect. The quality of cabin materials – particularly the plastics used on stalks and switchgear – is some way behind its rivals and the layout feels dated. On the road the Matiz is refreshingly honest and provides a timely reminder that you don't need huge horsepower and fat slicks to have fun driving. Even the wee 800cc unit is willing to be revved freely and with no drive-by-wire technology softening the feedback to the driver, he or she cannot help but feel connected to the road. This is heightened by a well-sorted chassis and suspension – an area in which the original Matiz was lacking. Despite the loss of its looks, the Chevrolet Matiz remains a strong contender in the entry-level car market. It does all the important things well and deserves its place in the pantheon of genuinely significant small cars. 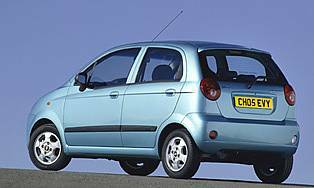 A few years ago the Matiz was among the cheapest new cars you could buy. It still is but these days faces stiffer competition from the Toyota Aygo, Citroen C1, Peugeot 107 and Volkswagen Fox. Free servicing for three years provides a major incentive, but resale values are likely to be weak. Running costs are minimal and a benefit of the Matiz's familiarity is that any mechanical problems should long ago have been sorted. Given the Matiz's tiny on-road footprint, it encompasses a remarkable amount of space. The clever roofline is high without making the car look like a lumbering mini-MPV and the seats have been perfectly positioned in the cabin to provide a practical compromise between passenger needs and luggage space. A tray under the passenger seat is a handy addition. S models lack seatback pockets, which is a bit stingy. Instruments and controls let the Matiz down a bit. They have a dated, cheap feel and layout and are constructed from some pretty poor quality plastics. The relocation of the main driver information to the centre of the dash isn't entirely successful, either. Okay, so it's not exactly a limousine and the seats are rather bench-like, but who cares? At this price you just want seats that stop you having to kneel while driving. There is inevitably a fair amount of engine noise in the cabin, but it only becomes harsh at very high revs and hearing it probably means you're not driving in a very clever manner. An immobiliser is fitted but that's about it. A hidden benefit of Matiz ownership is that thieves are unlikely to take much of an interest in stealing it. They'll fancy their chances of smashing the insubstantial side windows though, so avoid leaving valuables on display. 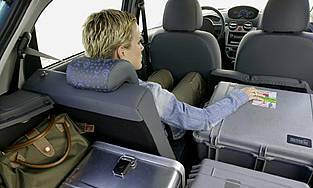 Full size driver and passenger airbags are provided as standard, the bare minimum for acceptance these days. 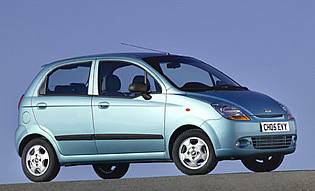 The Matiz is not generally regarded as one of the safest cars in its class and despite strengthening work, the thin metallic skin feels as if it would crumple all too easily in a collision. On the other hand, it's nimble and small enough to get you out of most dangerous situations. Perhaps surprisingly, the Matiz is great fun to drive. On paper its performance looks rather pedestrian but many small cars give an impression of going faster than they actually do and the Matiz is one of them. It can be driven enthusiastically and perfectly safely, as you're not going to be caught out by any sudden power surges. Steering is great and this car just loves to take tight corners. Obviously the Matiz won't cope with a large-scale family holiday too well, but as a second car it makes a lot of sense. Certainly if people used a Matiz to drop the kids at school instead of a large 4x4, our roads would be lot less congested. Novice motorists could do far worse than start their driving lives in a Matiz. The lack of power becomes a positive attribute, making selection of the appropriate gear imperative. Similarly, the assisted steering provides plenty of feedback and the chassis lets you feel the road without becoming harsh. In short, the Matiz forces you to drive correctly. Matiz buyers are unlikely to be overly concerned with image and similar fripperies. This is a functional vehicle chosen because it's cheap, not a fashion statement. With the city car sector becoming ever more crowded, the replacement of the Daewoo badge with Chevrolet's famous bow tie is a positive move. A low floor and doors that open to the full 90 degrees make the Matiz one of the easier cars in its class to get into and out of. Seatbelts are provided for five, though four is a more realistic maximum. The lack of a release catch on boot is annoying – it needs to be released from inside the car. A single-slot Blaupunkt RDS CD player is standard but S owners need to make do with a brace of speakers. Move up to SE and another pair appears in the back. Sound quality is adequate but nothing to get excited about. Chevrolet seems to be on a mission to mix some of the most hideous exterior colours yet devised. Pass on the opportunity to select Apple Green, Electric Yellow and Peach Orange unless you're trying to avoid conscription by claiming colour blindness. The day-glo pattern printed on the seat fabric is pretty nasty, too. A small car with a tight turning circle, relatively high seating position and thin structural pillars adds up to a great little parker. Few cars are easier to slot into a restrictive space. Sensors and other parking aids are totally unnecessary. Full size steel spare wheel is fitted as standard. Three models are offered, badged as S, SE and SX. Two petrol engines, of 800cc (50bhp) and 1.0 litre (64bhp), though the 800cc unit is only available as entry-level S. A five speed manual gearbox is the sole transmission available.